Healing Tree Agate tumbled and polished gemstones. Tree Agate encourages inner peace and certainty. It brings us awareness of our own strengths which provides us security and stability. Moves energy from the outer bodies and chakras into the physical level in the head-to-feet direction. Merges one's incarnate purpose with the earth change needs of the planet. Offers a focus on environmentalism, earth awareness and service to the earth. Raises mass consciousness, helps to save plant and animal species and to heal nature. Tree Agate has a trigonal crystal system. It is in the mineral class of oxide in the quartz group. It's coloring is white with green, mossy inclusions. During the formation of white quartz, green iron silicates flowed through and deposited in cracks that seem to resemble plant structures. 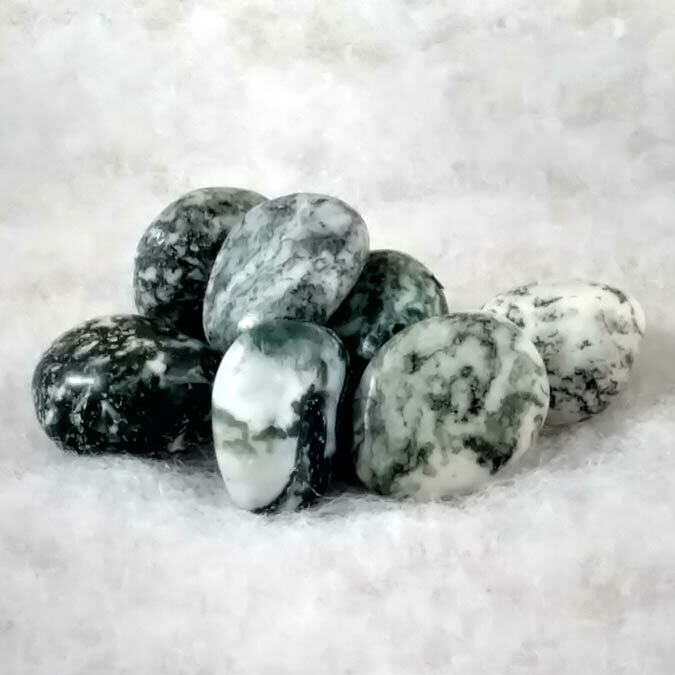 In earlier times, the term Tree Agate was also used for Moss Agate, Montana Agate, etc., but they belong to the chalcedony family (more clear and transparent) and not the rough quartz types which are very opaque. For this reason, the name of Agate for this one is actually false and it should be Dendritic Quartz. Since that name is already in use as a synonym for others it would seem we are stuck with the old name. Tree Agate needs to be worn for long periods of time to be effective. While it doesn't have rapid effects, it will inconspicuously and persistently build up. Tree Agate will strengthen our endurance and constancy. It will bring courage to situations where we feel unprotected or powerless. Tree Agate helps us to see difficulties as challenges and find the ways to deal with them. It can awaken the warrior in us and provide the means to strive and conquer those problems. 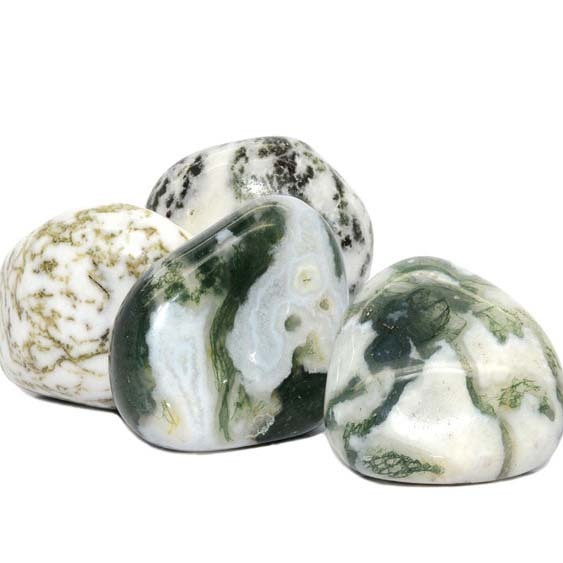 Tree Agate ensures vitality, good and stable health and a well functioning immune system. It assists us in becoming more resistant to frequent bouts of infection. Tree Agate, as with many Agates, has an affinity with Geminiis. It is a wonderful stone for those involved with agriculture, those who are botonists, and is also of value to midwives. Generally its associated planet is Mercury. It has a Receptive Energy and its Element is Earth. Due to its markings that suggest moss or trees, it has been used as a gardener's talisman for centuries. It has also been used in spells involving riches, happiness and long life.